ProSIM has assisted high pressure die casting (HPDC) companies to adopt casting simulation and reap benefits by prediction of casting defects, optimisation of gating design. Designers can arrive at the ingate size and angle to achieve proper flow of melt; study the standing wave formation in the shot sleeve; determine the number & location of air vents and overflows; determine the impact of pressure intensiffaction by conducting high pressure die casting (HPDC) simulation using ADSTEFAN. Figure above shows the liquid metal squeezed in the shot sleeve. Some of the casting defects such as air entrapment have their origins in the shot sleeve. ADSTEFAN has the unique feature to simulate the shot sleeve operations, and predict the standing wave formation in die casting. Figure above shows the filling of the melt in die cavity and air flushing. In the left figure, the grey colour regions represent the molten metal in the die cavity and the blue indicate the air region in the die cavity. Highlighted region with multiple colour mixture, represent the region where there is a mixture of air and liquid metal. In the above pictures the circled- highlighted regions show the regions with probability of air entrapment defect formation. Figure shows the temperature of the melt during die cavity filling. Temperatures of the different streams of melt which meet and merge is visualised clearly by casting simulation of HPDC process. Specifically, if the temperature of the melt in any of the streams of flow becomes lower than the solidus temperature of the alloy, cold shut defect formation occurs. 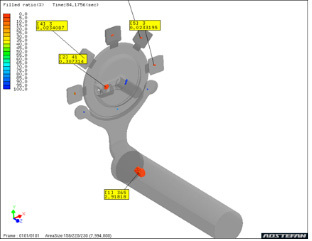 Casting simulation assists in prediction of the cold shut defect. Figure above shows the velocity vectors in the melt region in the die cavity. The die erosion defect can occur in the regions of high velocity, especially in the corners and sharp edges in die. In the figure, the regions in the red arrows are characterised by high velocity and turbulent flow, where die erosion defect is highly probable. Visualising this by casting simulation, designer can optimise the gating to achieve lower velocities and overcome the die erosion defect. Figure above shows the formation of shrinkage porosity defect seen from HPDC simulation. There are many shrinkage porosity defects predicted in the die cast component. Figure shows shrinkage porosity occurring at a critical region in a die cast component. Size of the shrinkage porosity defect predicted by high pressure die casting simulation is seen to be around 3 mm. Right side figure shows the shrinkage porosity defect opening up during tapping process.